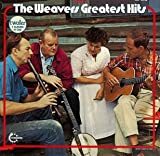 The Weavers were an American folk music quartet based in the Greenwich Village area of New York City. They sang traditional folk songs from around the world, as well as blues, gospel music, children's songs, labor songs, and American ballads, and sold millions of records at the height of their popularity. Their style inspired the commercial "folk boom" that followed them in the 1950s and 1960s, including such performers as The Kingston Trio; Peter, Paul, and Mary; The Rooftop Singers; and Bob Dylan.